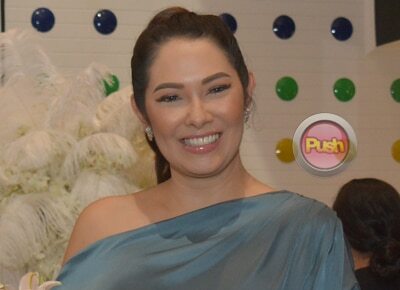 Ruffa Gutierrez wants to inspire women to find Mr. Right. With the launch of her first book The Truth and Lies My Mother Told Me, Ruffa Gutierrez admitted that she has learned a lot of life lessons from her mother Annabelle Rama. Despite their disagreements on some matters, Ruffa says she finally understands her mom’s side. "Marami akong natutunan sa love sa nanay ko especially now na the girls are 12 and 13 (daughters Venice and Lorin). I always say na tama pala yung paghihigpit ni mommy. Maybe she expresses herself in a way na minsan hindi ko naintindihan and minsan nagkakaroon kami ng mga sagutan. I know she has the best interest at heart for me. I know she just wants the best for me. Ang masasabi ko maraming salamat sa iyo Ma, sa pinagdaanan natin na ups and downs. Alam mo at the end of the day mahal na mahal mo ako and based sa mga nangyari sa akin recently, nakikita ko yung pagmamahal mo. So I just want to say thank you very much for protecting me and guiding me. Sometimes matigas ang ulo ko but you know that I love you and hopefully I can make it up to you sa mga susunod na mga taon,” she shared during her ABS-CBN Publishing book launch held last November 29 in Taguig city. Ruffa said her book is not just for women her age still looking for love. "Para ito sa lahat ng mga tao na gusto umibig. You can love at any age. It doesn’t mean that if you’re old already or if you’re 50 or 60 years old hindi ka na puwede ma-in love. I believe with this book it can give you tips. I have a lot of single friends and I dedicate this to all of you na in 2017 you’ll find the love of your life. Marami akong mga non-showbiz friends na talagang hindi nila mahanap hanap yung kanilang Prince Charming and sabi ko, ‘You know what, you will fall in love when you least expect it.’ And I’m not the best when it comes to love but I can say that I’m happy. 99% of the time they always have nice things to say about me in the end. Hindi naman sa sobrang dami nila pero sa mga tumatak talaga at sa mga naging bahagi ng buhay ko. Most of them 99.5% ay magkakaibigan pa rin kami hanggang nagyon so yun ang maganda,” she recalled. The 42-year-old actress said she is hoping that the book can be the first of many in a series that she can write about. Ruffa said that she also looks forward to starting work on TV again soon. "Ang plano namin sa book ay sana maging successful para may part two, may part three at part four kasi ang pag-ibig naman walang katapusan. Actually may mga offers ako (for teleseryes). Maraming salamat sa mga offers. We’re going through it. May kasabihan talaga na when it rains it pours at ang importante, when it pours embrace all of the blessings but kung wala naman, if there’s a drought in your life, in your love, in your career, you know make the most of it. It doesn’t mean na kung wala kang project or hindi ka nakikita sa TV my gosh walang nangyari sa buhay mo. You know I was concentrating on other things and other businesses so I’m very happy pero malapit na ako magkaroon ng project. Darating na yan,” she said. Ruffa said she and boyfriend Jordan Mouyal are still going strong. "No I’m not single. I’m not single. Sorry guys! (laughs) Yung mga non-showbiz huwag na natin pag-usapan. I’m happy in love. I’m very balanced. I think when you fall in love it should be balanced. Pangit naman ang isang pag-ibig na you and me against the world. Hindi na uso yun. Kailangan the love of your life should fit into your life as well. Siyempre may mga anak ako, may career ako, hindi naman puwedeng puro love, love lang tapos wala kang makain sa table. I’m sure mag-aaway din kayo right? So hindi naman puwedeng career, career, career or puro love kasi boring naman. So everything has to be balanced,” she shared.